Among fans of the world’s biggest three esports (League of Legends, Dota 2, Counter-Strike: Global Offensive), 42% are spectators only: they don’t play the game they watch. And we use the singular advisedly: 70% of them watch only one of those games. 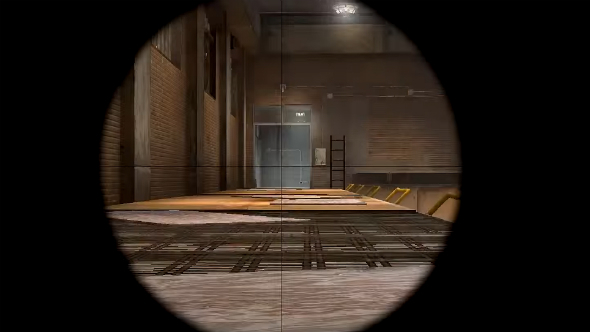 Keep up with the latest changes to CS:GO with our update tracker. That’s according to ablog post by esports analysts Newzoo. Their post explores three questions: How do some of the biggest esports franchises compare in terms of players and viewers? How big is the overlap between gamers and viewers? What is the overlap between franchises in terms of reach? Though Newzoo focused mainly on the ‘big three’, they also include comparisons with Overwatch and Hearthstone. Their figures are aggregated across gamers in the USA, Canada, Germany, the UK, France, Italy, Spain, Belgium, Sweden, and the Netherlands. 30% of CS:GO fans, 26% of League fans, 20% of Dota 2 fans, 18% of Overwatch fans, and 18% of Hearthstone fans do not play the game they watch. 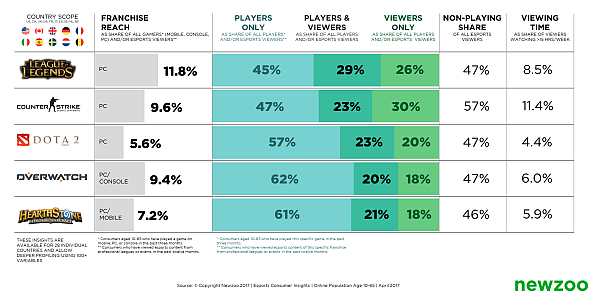 Among the top three esports (League, CS:GO, Dota 2), 42% of their viewers don’t play the game they watch. League of Legends leads the way in terms of franchise reach, with an 11.8% share of “all gamers and/or esports viewers”, followed by CS:GO on 9.6% and Overwatch on 9.4%. 70% of esports fans only watch one of the ‘big three’ esports franchises – League, Dota 2, and CS:GO. Dota 2 fans are the biggest esports viewers overall, with 35% of them watching more than six hours of pro gaming a week.